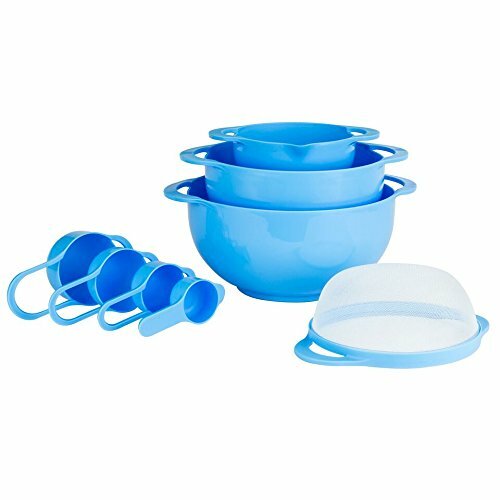 Colorful and non-toxic, these set of Intriom Mixing Bowls will definitely give you delight in cooking! It is made with non-toxic heat-resistant ABS plastic that is perfect for stirring, serving or mixing. It is also made with slip-resistant bottom and handles to avoid accidents in serving or cooking. CUSTOMIZED FOR YOUR NEEDS - Set comes with different sizes of bowls and measuring spoons and cups. Ideal for mxing or serving purposes. CHILD-FRIENDLY - Comes with a non-slip bottom. The item is safe for use by children. If you have any questions about this product by Intriom, contact us by completing and submitting the form below. If you are looking for a specif part number, please include it with your message.